I'm a librarian in Old Town, Alexandria. Best job in the world! Of course, we have bestsellers and books on current topics, but my library also has tons of information about Alexandria. We're a popular stop for people who are researching the histories of their historic homes or tracking down their Old Town ancestors. As you might imagine, the library is a prime site for gossip. Not that I would ever engage in it. But I find myself the source of the whispers, which I just hate. I try to throw back my shoulders and hold my head high, but I know who they're whispering about. You see, when my husband, Hollis, and I separated, a tramp latched onto him. Now, Hollis has his good sides, but let's be honest, he's twenty years older than she is, and he hasn't exercised since before she was born. There's only one thing she wants–his money. Did I mention that all his friends drool over her? She wears her blouses down to there and her skirts up to you-know-where. If he was having a mid-life crisis, why couldn't Hollis buy a red sports car like other men? There's going to be a trendy underground dinner in Old Town. Have you heard about them? You don't know where it will be, who the chef is, or what will be served until the last minute. I bought tickets for my son, Gavin, and me. But now I've heard that Hollis and the bimbette will be there. The tickets are very pricey. I don't have money to throw away. But I want to attend! I don't want to cancel my plans because she might be there. On the other hand, it would be less stressful to stay home and order pizza. In honor of the release of THE DIVA COOKS UP A STORM, Krista is giving away a copy to one person who leaves a comment here today. Don't forget to leave your email address so we can contact you if you win! I think pizza. My mother-in-law s blind and she listens to a lot of books. Thanks for ding this. Weird about my above comment written in April. I would go, get all dressed up and have fun. I would go! Don't let someone spoil YOUR fun with a fear that you "might" see them. So what if they are there. Hold your head up, know you are special and think of everyone else there instead of one or two. Can't wait for the opportunity to read "THE DIVA COOKS UP A STORM"! LOVE - LOVE - LOVE the cover! Purples and pink are my two favorite colors and hydrangea are one of my top flowers reminding me of my Granny who grew them. I would go and have a great night with my son! Happy release week. Thank you for the chance to win! I think you should go to the dinner. It sounds like such fun. Hey. You can eat pizza any day! Maybe the husband and bimbette will have a meal of crow. Right? If it was something I was looking forward to attending, I would definitely go and have a good time. Let Hollis see you having a great time. Go and have a good time with Gavin. Staying home with pizza sounds relaxing to me. Stay home and order pizza. I would put on a nice outfit and make sure i look good, then I would attend the opening. 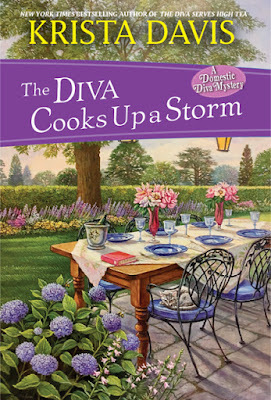 So glad that the Domestic Diva Mysteries are continuing. I put my name on the library hold list as soon as the new title was listed.